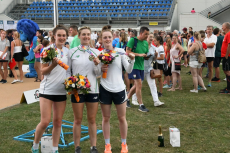 Irish modern pentathlon is celebrating another landmark achievement after Natalya Coyle, Eilidh Prise and Sive Brassil joined forces to win women’s team silver at the 2018 ECMP European Championships in Székesfehérvár, Hungary. World No.5 Coyle finished 5th in the individual standings, with Prise 11th and Brassil 21st – all three enjoying their highest-ever finish at senior European level. Their combined efforts saw them scale the podium as team medallists alongside Hungary (gold) and France (bronze). It was Prise’s second medal of the championships as she and Kate Coleman already secured silver in the women’s relay on the opening day. And this may not be the end of the medal haul as 2015 European champion Arthur Lanigan-O’Keeffe goes in the men’s individual final tomorrow (Sunday). “We’re all really, really happy,” said Coyle, a top-10 finisher in the 2012 and 2016 Olympic Games. “It’s the first time we’ve had three girls in the final and to come away with a medal shows the fantastic progress we are making. Eilidh and Sive already won a relay silver so it’s been a great championships. For Coyle (27), it was a performance of great stealth and perseverance. She kept herself in contention during what might be regarded as her weaker events, ranking 12th in swimming (2:18.78) and 11th in fencing (20 victories / 15 defeats). With typical composure she enjoyed a clear round in riding, where a perfect score of 300 vaulted her into 8th position ahead of the laser-run. There she made inroads into the field, swallowing up three rivals, and crossed the line just five seconds after bronze medallist Sarolta Kovacs and her Hungarian team-mate Tamara Alekszejev in a time of 12:31.06. Ahead of them, Marie Oteiza continued a champagne month for French sport with an outstanding gold medal as Kate French claimed a strong silver for Great Britain. The Europeans, which will be an Olympic qualifying event in 2019, is always one of the toughest events on the pentathlon calendar and the Irish women outperformed many of the biggest names in the sport today. 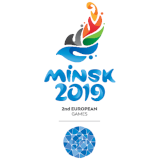 In finishing 11th, Prise beat the 2017 world gold and bronze medallists, Gulnaz Gubaydullina of Russia and Anastasiya Prokopenko of Belarus, to the line. 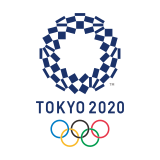 Prise (22) emulated the performance of Coyle in many respects, with a perfect riding performance (300) giving her momentum ahead of the laser-run where she made up three places from a starting position of 14th. Brassil (24) ranked 7th in swimming with a time of 2:14.56, and she incurred just one penalty in riding (293) to start the decisive laser-run in 23rd. The success so far in Hungary has continued an extraordinary summer of highlights for Ireland’s elite pentathletes, who are starting to become accustomed to the status of podium potential at all levels. Lanigan-O’Keeffe (26) won bronze in the prestigious World Cup Final last month in Astana, Kazakhstan after winning a spectacular gold in the final event of the regular season in Sofia, Bulgaria. Coyle finished just shy of the podium in fourth place in the women’s individual event in Astana, having secured a silver medal on her previous outing in Sofia. Prise made a big impact at the recent World University Championships in Budapest, Hungary where she was sixth in the individual and fourth in the mixed relay alongside Michael Healy. In May, Coleman (28) teamed up with Healy to win an excellent silver in the mixed relay at the World Cup event in Kecskemet, Hungary, while Brassil finished 14th in the first two events of the season in Cairo and Los Angeles. For further information contact Jonathan Coates on +44 7788 352219.